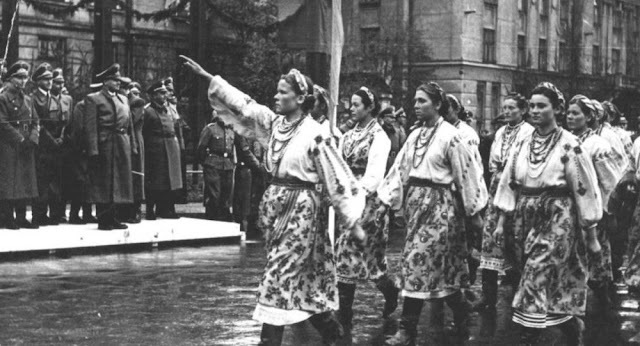 Ukrainian women, some in native garb, greet advancing Wehrmacht troops during Operation Barbarossa in 1941. Ukrainian separatists, eager for freedom and fighting oppressive former rulers; armed rebellion, with different factions in East and West Ukraine battling for control; acts of terrorism that destroy the enemy's planes and vehicles; an encroaching enemy, bent on re-conquest and, ultimately, vengeance and punishment; occupation by a reviled enemy. Seems like we read online about all that happening in Ukraine yesterday or the day before, and heard about some new tragic incident going down there just last week - or was it last month? But the events listed above are what the Ukrainian people experienced not just in 2012, 2016 and the years in between - but also in 1941-1944. Murky political turmoil in what has been called the "breadbasket of the earth" is nothing new, and the same problems keep repeating themselves. 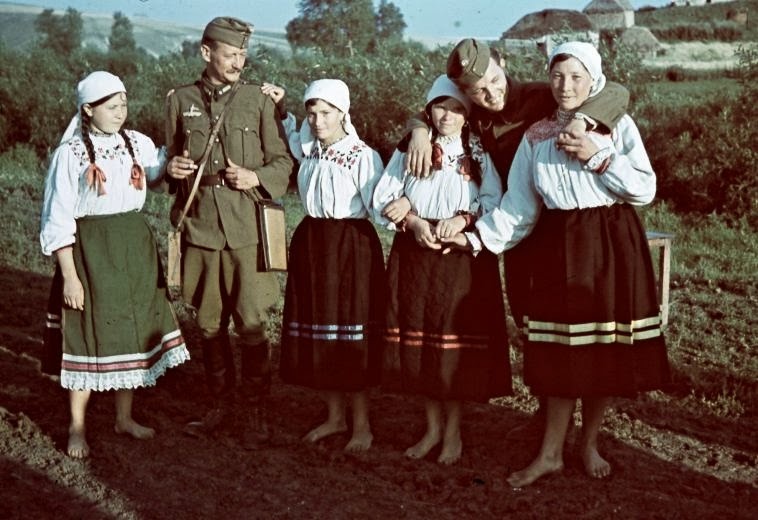 Ukrainian collaborator girls were a passing part of that phenomenon during World War II, and the subject merits more study than it has received. Victims of the 1932-1933 famine. World War II tore the Ukraine apart. The Ukrainians had good reason to be, shall we say, disenchanted with Soviet rule at the outbreak of the war. 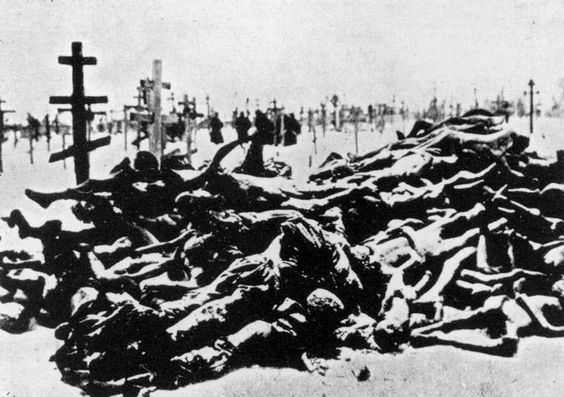 The Ukrainian famine/genocide ("Holodomor") of 1932-33 was a bitter recent memory. How many innocent Ukrainians perished under Stalin's benevolent (if you believe Soviet histories) rule is highly debatable and, truthfully, will never be known. There is solid agreement, though, that it was a lot - certainly in the millions. Many millions of innocent men, women and children were carried out of their huts, put in piles and burned. That is exactly what the authorities intended and was their desired outcome. This makes more sense in context. Other atrocities beside the famine - or contributing to its lethal effects - were committed as well. Dekulakization was official Soviet policy directed against better-off peasants and their families in 1929–1932. The systematic elimination of entire classes of people, the overwhelming majority of whom were just regular folks aside from whatever political evils the state impugned them with, is something that the survivors tend not to forget. Thus, what follows did not just come out of the blue. While most evidence of collaborator girls comes from the West for purely pragmatic reasons, there was a great deal of collaboration in the East, too. 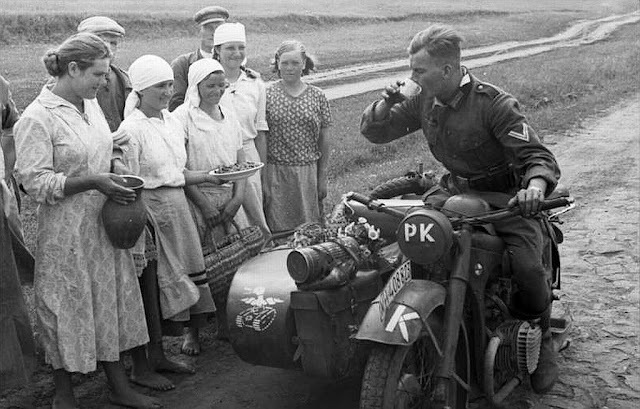 While the Germans never pressed it nearly forcefully enough for their own good, they did make some perfunctory steps toward encouraging friendship with the locals. 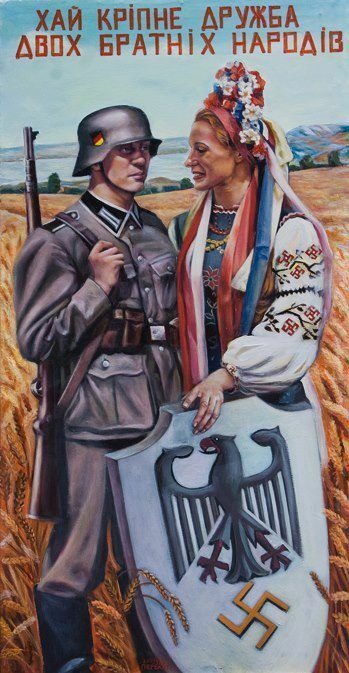 A propaganda poster encouraging collaboration by Ukrainians. "Let there be growing friendship between our two brother nations." It was no secret to anyone that many Ukrainians were not enthralled by the Soviet regime. Stalin was a Georgian from far to the South who spoke with a thick accent - think Alabama accent as compared to New England - and many of his purges appeared targeted specifically at the Ukraine. There also was a long-standing religious tradition in the Ukraine which Stalin and his regime attempted to suppress. It is important to remember that peasant girls were completely unsophisticated and unworldly. They may not even have understood what was happening in terms of politics and what it meant to fraternize with the "other side." 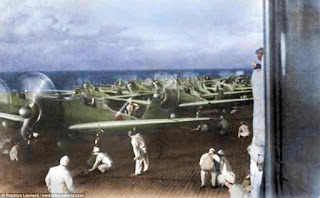 So, when pictures show them mingling with Axis troops, they may simply be acting politely to guests (Tamas Conoco Sr.). 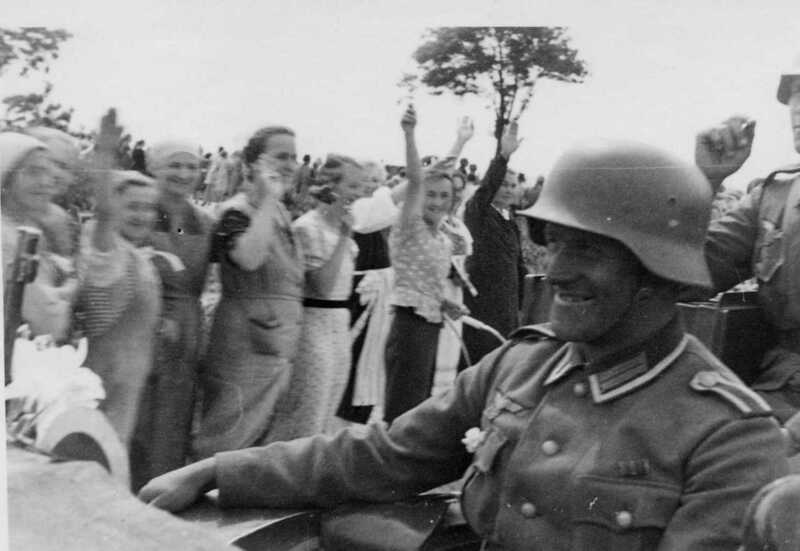 The disaffection manifested itself openly at time, most particularly during the opening stages of Barbarossa in 1941, when young women greeted the advancing German troops with delight. Of course, there were undoubtedly other reasons beyond politics that may account for friendly greetings. The girls may never have seen a college educated man before, or one who had been outside their home district. These men never had mistreated them personally and soon would be on their way. Peasant girls are trained to be polite to strangers in general. However, personal accounts indicate that there also was an underlying hope of change, of transition to a new, freer life. After the war and Stalin's passing, a succession of Ukrainian Soviet Premiers papered over the feelings manifested in these pictures, but it has always been there. The collaboration was not just a few scattered maidens. In the spring of 1939, the Organization of Ukrainian Nationalists ("OUN"), a separatist political organization working for Ukraine's independence, created a military unit, the Ukrainian Legion. The 600-man Legion was set up outside the town of Hammerstein, western Germany, with training camps in the Reich and Slovakia. The Legion later participated in the invasion of Poland and Operation Barbarossa. They later joined the Ukrainian Insurgent Army and reportedly killed 100,000 Poles. The group remained active well into the 1950s. 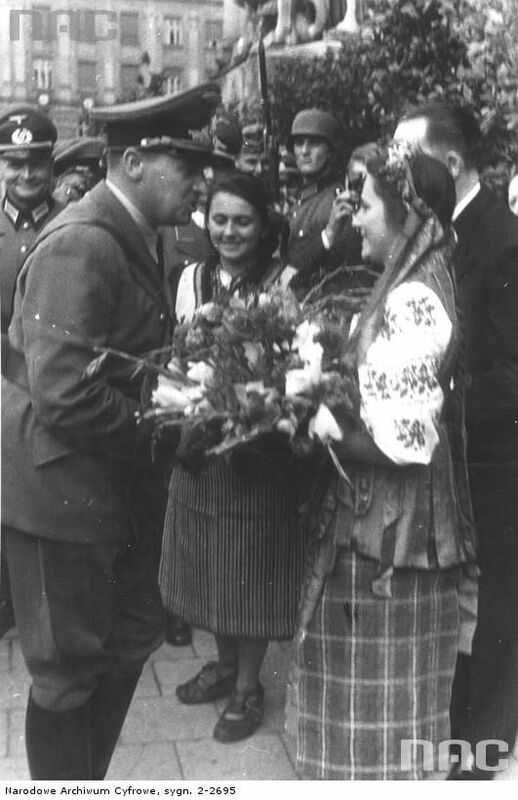 A parade in Stanislav honored a visit by Hans Frank, Gauleiter of Poland. It is perhaps a stretch to call some of these girls "collaborators." Some were simply overjoyed to be relieved of the Soviet yoke. A posed picture. Whether it reflected something genuine or completely manufactured is impossible to tell now (Ang, Federal Archive). But, at least for a while, they were happy to help out. And, yes, some were collaborators in the truest sense of the word. 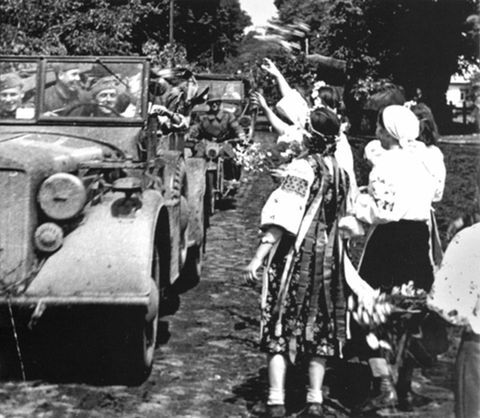 Local girls greet the Germans, whose faces are still covered with road dirt (Gotze, Federal Archive). In addition, it wasn't just Ukrainian women. Many in the Baltic states also had had enough of the repressive regime. 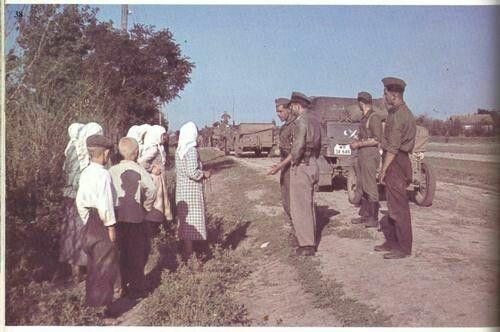 Latvian women greet advancing German soldiers with supplies. There are some who question the validity of these photos, and their point of view should not be discounted. According to them, these were manufactured for propaganda purposes, and either "shopped" as we would say, or there were men with guns pointed at the women standing just off camera. Notice how the German soldiers in these shots are almost all handsome, as if they were male models (I'm sure they would be flattered by that!). The girls are usually pretty. Everyone is neat and presentable. In addition, these shots, even if authentic and genuine, may not show love for the German conquerors so much as a desire by new subjects to ingratiate themselves with their new overlords, whoever they might be. 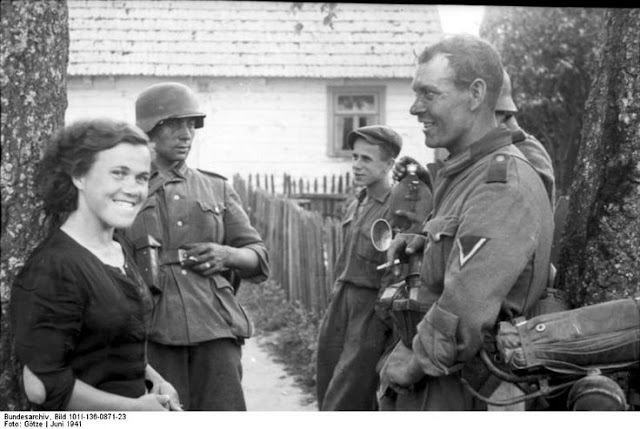 In that sense, these are amazingly similar to photos taken a few years later, when American boys chased the Germans out of France and the local ladies could not have been nicer to their "liberators" - which gives one pause for thought. In addition, bear in mind that the husbands, fathers, brothers and boyfriends of some of these women were the ones the Germans had just chased out of town or shot and killed. I don't know the conclusive answer. 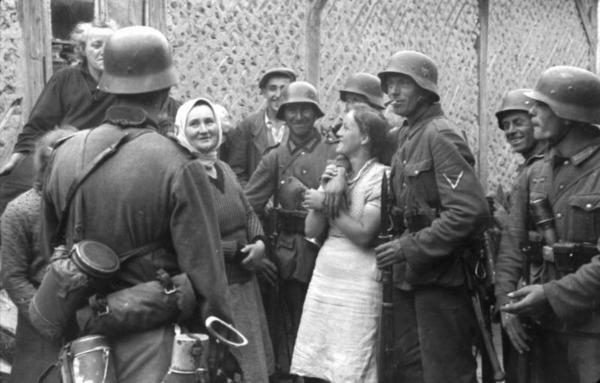 However, the pictures match many accounts of the heady days of June and July 1941, when Stalin and his deadly NKVD men suddenly were no longer a threat in the back of everyone's minds. It also is a fact that the Partisan movement was much stronger in Russia proper than it was anywhere further south. There simply was not much love for the Communists in the Southern lands, and with some exceptions the further south you went, the more open the locals were about not caring whether the Soviets ultimately won. This is not something that Russians today want to even discuss or consider, much less admit. There are so many of these photos that the sheer number alone argues against their all being manufactured. Hitler did not particularly seek a partnership with the Ukrainians anyway, so the odds of his directing Propaganda Minister Goebbels to spend a lot of effort making up things he found pointless anyway seems remote. Hitler truly did view the Soviet peoples as Untermensch, subhuman filth, and this attitude extended to his subordinates. Hitler's Generals repeatedly advocated a change in that attitude because they knew it was the only way to win the war, to no avail. Part of the problem people have with these photos is that it goes completely against the grain of how things "should have been" to see Germans as in any way liberators. Without going off on an extraneous tangent, recent events in the Ukraine - excuse me, Ukraine - seem to encapsulate the underlying and seemingly eternal dissatisfaction endemic to the region regarding remote rule from Moscow. The strange tale of General Vlasov, considered akin to Benedict Arnold in Russia, is particularly pungent in that regard. 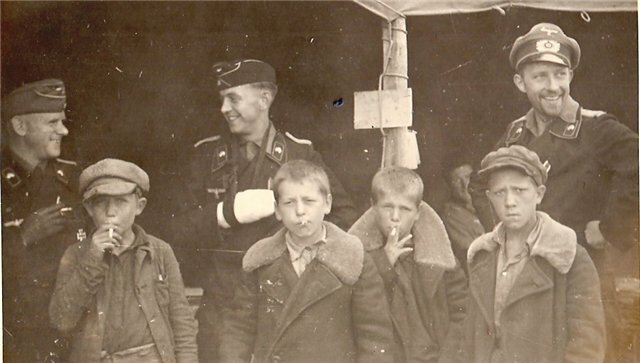 German soldiers give Soviet kids smokes during Barbarossa. This subject is very complex, and the eventual shift in feelings against the Germans probably had more relationship with the changing war situation than some other factors - nobody wants to be seen siding with the losers, and by August 1943 it was clear to all which way the winds were blowing. It also is natural to prefer tyranny by local forces who at least speak the local language than alien ones, if one absolutely has to choose. 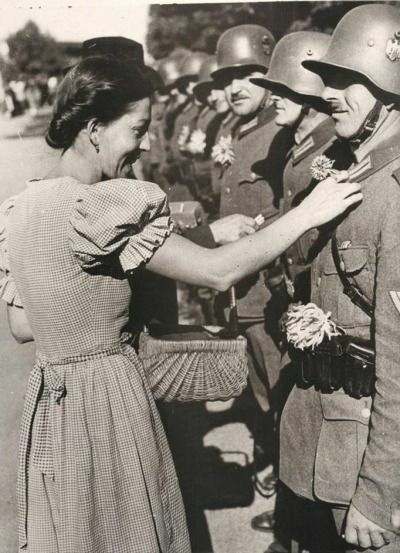 In any event, the happy feelings of the roadside ladies soon disappeared under a mountain of punitive German edicts and brutal exploitation as the glamorous frontline troops were replaced by sluggish bureaucratic hacks from Berlin who were neither charismatic nor friendly. They were only interested in stealing as much as possible from the indigenous peoples of the conquered lands and leaving only enough to keep them working for the Master Race. 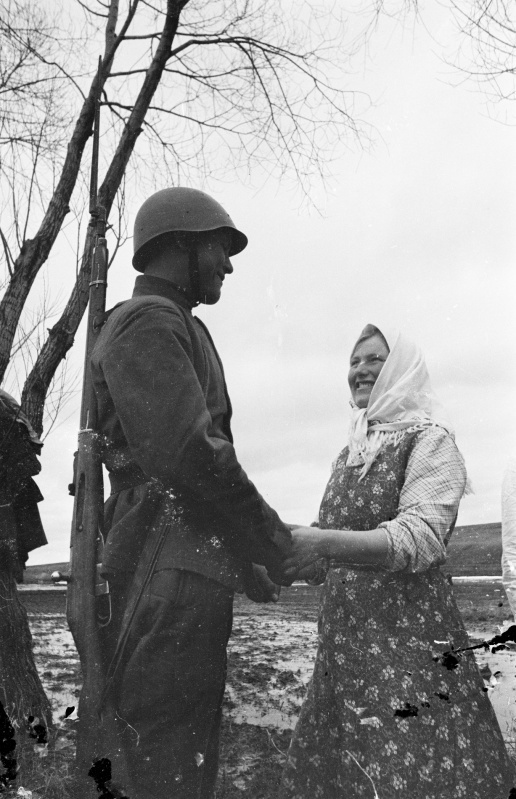 German attempts to enlist the Ukrainians ultimately failed, and General Vlasov later turned on the Germans he had deserted to from the Soviets. 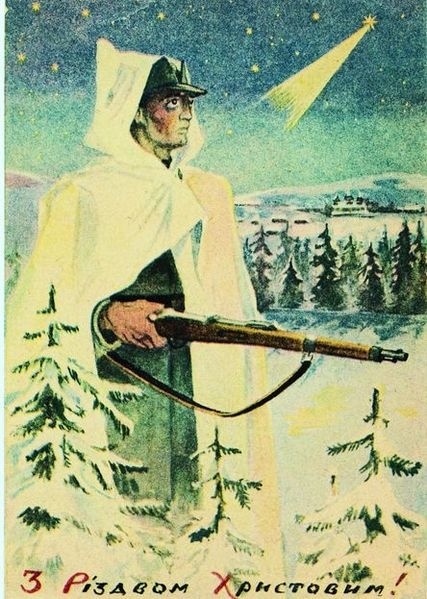 This is a Ukrainian Christmas Card in WWII (1944 I imagine), depicting their army's struggle against both Germans and Soviets, relying on the star of Christ. This is such a sad card, as there really was no hope for these brave people who just wanted all the foreigners to leave. Many, including myself, consider the refusal of Hitler to countenance any but the most brutal treatment of the conquered peoples to have been one of his biggest strategic blunders. Mistreating the locals was much more significant to the outcome of the war than poor tactics in individual battles such as Stalingrad. And it led to other problems later, too. When writing about one aspect of the war, inevitably other elements are dragged in. Everything is related; you must follow a stream of events to reach the end of the war, and nobody rings a bell to say when peoples' allegiance changes. The most difficult part of writing discrete articles about the war is compartmentalizing them so that you don't start wandering off and lose your readers' interest. This page is primarily about the early stage of Barbarossa, when there was hope within some "conquered" peoples that the conquerors would be an improvement over their former masters. However, I would be remiss in ending this page by leaving the impression that Ukrainian girls were nothing more than handmaidens of the Third Reich. They were not, despite some early enthusiasm noted above that had much less to do with the Germans and much more to do with what they saw as oppression emanating from Moscow. When the Ukrainian enthusiasm for their "liberation" wore off is impossible to say. Certainly, the savagery of the bureaucrats who replaced the front-line soldiers - who, with the huge exceptions of the SS and Einsatzgruppen, on the whole acted correctly - played its part over time. More important to the transition in allegiance, though, were the German reverses in the war. The inability to take Moscow in 1941 was a huge blow to Ukrainian collaboration. 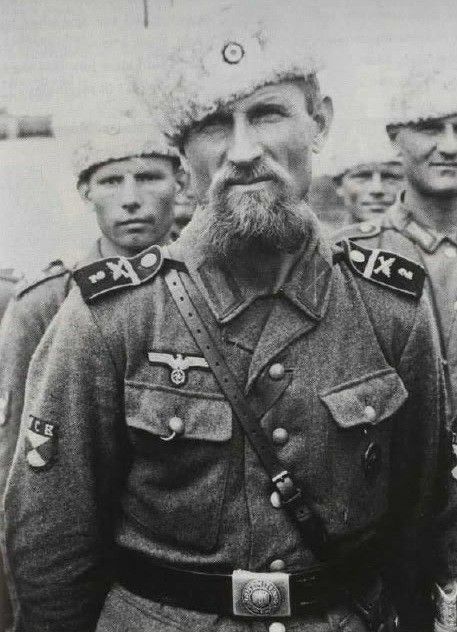 However, Soviet Lt. General Andrey Andreyevich Vlasov, a Ukrainian patriot, went over to the Germans long after the successful defense of the Soviet capitol. Vlasov defected in July 1942, after German forces south of Leningrad destroyed his command, the 2nd Shock Army ("Shock" being an honorific title). So, there was still some Ukrainian disaffection throughout 1942. 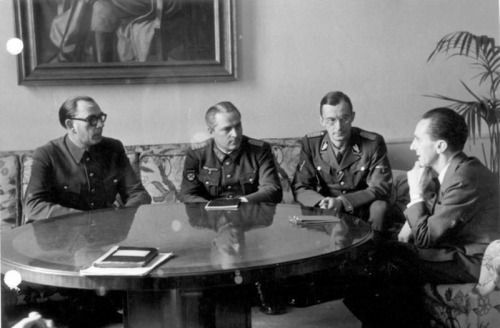 General Vlasov meets with Propaganda Minister Joseph Goebbels. Vlasov, though - who is considered somewhat more loathesome in Russian history than Benedict Arnold is in American lore - picked a very poor time to change sides. The German defeat at Stalingrad in early 1943 showed just about everyone which way the winds were blowing, and the defeat at Kursk in July 1943 closed the door on Ukrainian collaboration. Polina Gelman, 1919-2005, born in Berdychiv, Ukraine. She was a Soviet Air Force officer and the only Jewish woman decorated as a Hero of the Soviet Union for her service in WW II. 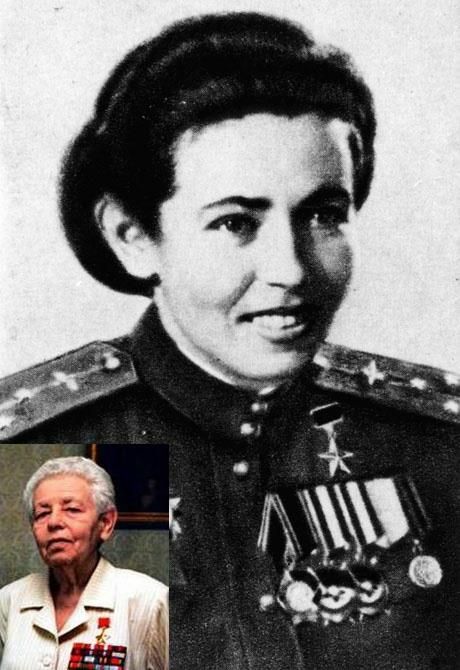 Gelman served as a navigator in the all-female night bomber regiment called "Night Witches". Soon, the Soviets were reconquering the Ukrainian lands. 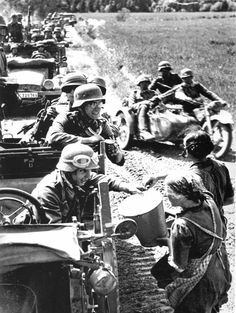 Many Ukrainians all along had remained in the Soviet military, of course, and more were impressed into service as territories were retaken. The partisan movement grew exponentially during 1943, and many of the girls who had been greeting the Germans as liberators were soon trying to kill them. 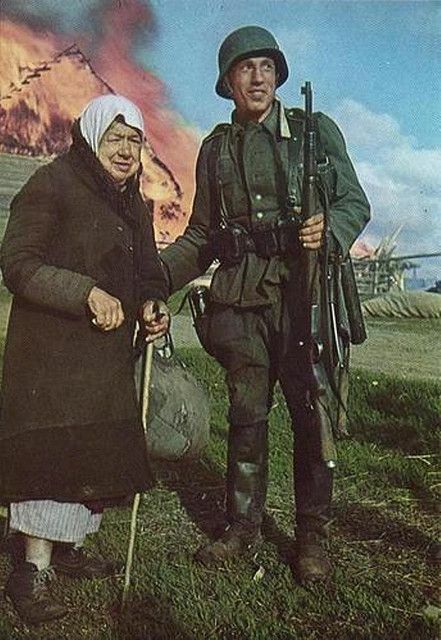 This obvious (and somewhat odd) propaganda shot sort of sums up the Ukrainian experience: a Wehrmacht man assists an elderly Ukrainian woman while behind her what may well be her home or that of a relative burns to the ground. The Soviets knew all about the Ukrainian disaffection. The notorious "Smolensk Manifesto" of early 1943 was widely distributed and explicitly promised that the Germans under Adolf Hitler would rebuild the conquered lands after the defeat of the Soviet Union. The Soviets even now and then met Vlasov's "Russian Army of Liberation," which marched under St. George's Cross, in battle. 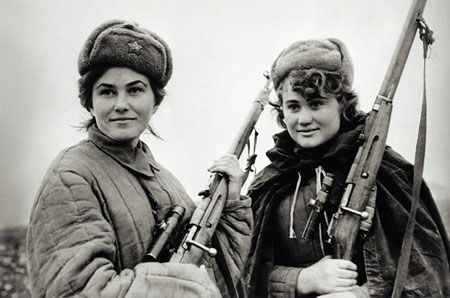 As they reconquered Ukrainian territory, the Soviets cynically gave the native men rifles, rudimentary uniforms, and then quickly sent them in masses against the German lines. Casualties were horrendous, but the Ukrainian men softened up the defenses, causing the Wehrmacht to expend huge sums of ammunition and energy before the main attacks by highly trained and well-armed Soviet soldiers. 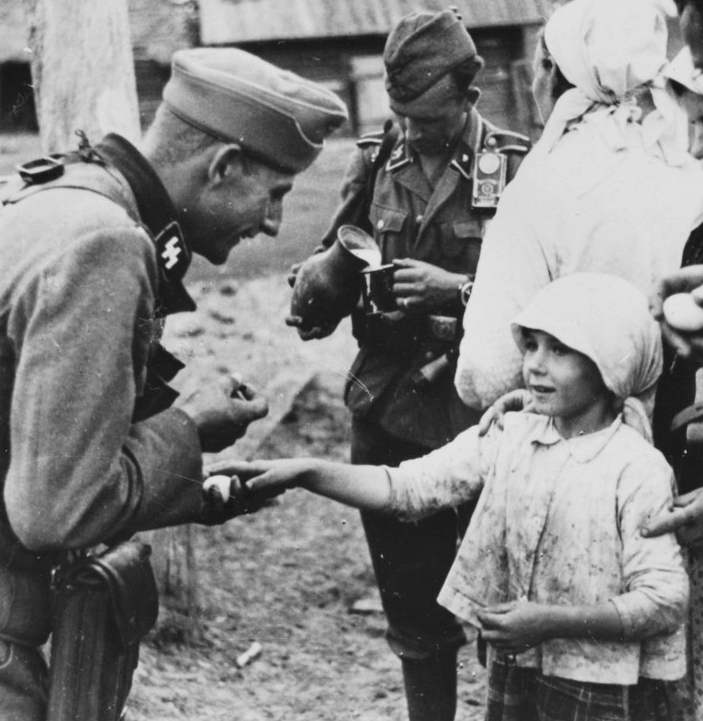 A Ukrainian girl in Lviv, Ukraine being harassed by the Germans. Needless to say, the whole affair always has been controversial and elicits strong feelings to this day. Some peoples of the former Soviet Union vociferously deny that any collaboration at all took place, and that all the photos above of collaboration were staged. Under this analysis, Vlasov was a one-off and the mass of Ukrainians remained loyal to the Soviet state throughout. That position cannot be ruled out. 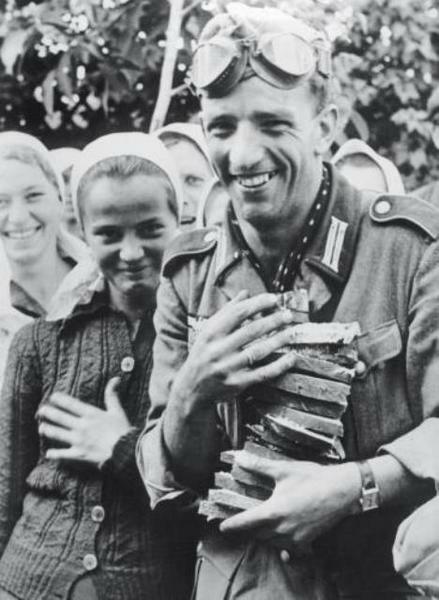 However, there is a great deal of evidence that, early in the conflict, the locals were roughly as happy at the lifting of the Soviet yoke as they later were about the German withdrawal. I have a page for collaborator girls in Western Europe here. In response to a good question: I have only heard about "The Forgotten Soldier" by Guy Sajer, but haven't actually sat down and read it. I know it is a classic, and I would like to go through it when I can grab a copy. It does talk about soldiers and their Ukrainian girlfriends, so is kind of on-point with this article, so felt it worth mentioning here. Apropos of nothing, "Cross of Iron" with James Coburn has an interesting scene along those lines which kind of presents a realistic view of how a lot of "relationships" went down in those trying times. Anyone who has seen the film knows exactly what I am talking about. 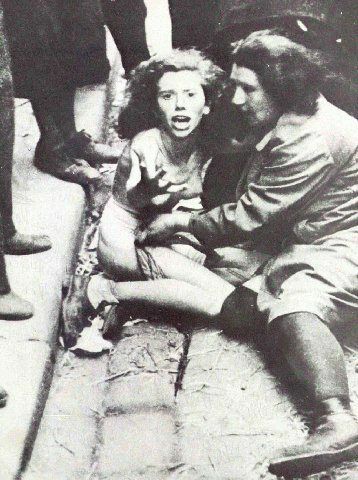 The girl in Lviv picture, I have seen it elsewhere & it was captioned as a Jewish woman attacked by her own countrymen.